I don’t know about yours, but my kids aren’t perfect. They are, after all, a mixture of me and their dad, who both possess several flaws of our own. They all play sports. My husband and I love to watch them play, but up until this past year, I didn’t really tell them how much nearly enough. Look, statistically speaking, the chances of your kids or my kids playing sports beyond high school are not high. Just read the information put out by the NCAA if you don’t believe me. For over three decades, Rob Miller and Bruce E. Brown of Proactive Coaching LLC studied and interviewed college athletes – specifically, what (in the athletes’ own words) happened to them growing up that had negative repercussions on their sporting careers versus, conversely, what built them up on their paths to success. Student-athletes overwhelmingly answered that the most negative response from their parents took place on the car ride home, when the youth were trapped in the same space as their well-intentioned parents offering ill-timed advice to them after the competition was done. What was the single best thing these athletes reported hearing over and over again from their parents? 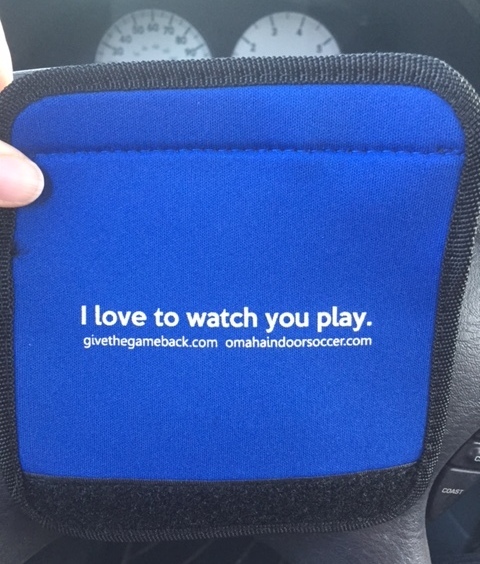 Six simple, yet powerful, words: I LOVE TO WATCH YOU PLAY. 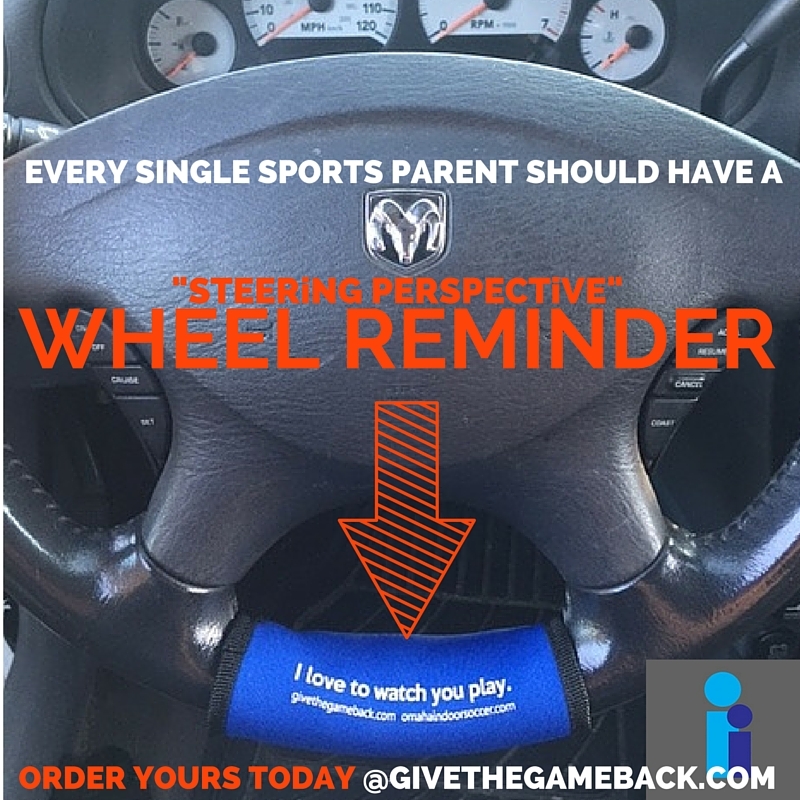 If you are like I am and sometimes need a reminder to control your own overly competitive spirit (especially following games) consider picking up a new product on GiveTheGameBack.com called the “Steering Perspective” wheel reminder. You can affix this velcro, soft fabric signage around your steering wheel as a visual cue to enjoy the car ride home…or at least control your urge to correct your young athlete on each and everything they did wrong. Order your “Steering Perspective” wheel reminder today for you or someone you love. Twenty five percent of all proceeds from now through December 31, 2015 will go to All Play Sports Complex. ***Twenty-five percent of all proceeds from the sales of this product from now through December 31, 2015 will go to All Play Sports Complex. Read this article to get more information about this fabulous organization in Omaha, NE, that provides barrier free access to sports and other recreational activities for people with physical or mental disabilities. This video is pretty cool too. I had to take this one in for a while. For many years I lived with a high school and travel ball coach who coached her teenage girls in softball. I always hated the rides home after the games. I could easily distinguish the mother coach from the mother mother. The mother coach was the sensible one. The mother mother is the woman I would ultimately leave. To this day her relationship with her daughters, both playing D1 ball now, is severely strained for her relentless pursuit of perfection. In her defense, she suffered the same childhood. I guess that’s a defense…. I recently read an article about a young stud basketball player who is transferring to my alma mater and should help the team a lot. In the article, he freely admits that he chooses not to call his dad after some games because he wants to avoid the conversation of what he could have done better. I’m not naive enough to think my kids will take the time to talk to me after each and every one of their sporting competitions, but I would want them to WANT to share their experiences with me. Long-termed severely strained relationships between (adult) children and their parents is not worth short-term success in my eyes. The only sentence I add to the mix is “Did you have fun out there?” which I follow up with “I had a lot fun watching you play.” The ride home if for unwinding. Tomorrow the coach in me can tell you what I think you did really well and what you might want to think about for next time. And then I still remind you how much I enjoy watching you play. Yes!!! 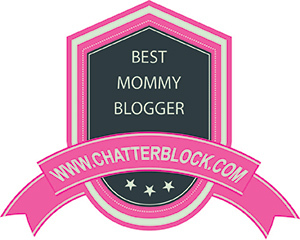 Continually checking with your kid to make sure they are having fun. Otherwise, why are we investing the time, energy, and their emotional well-being?